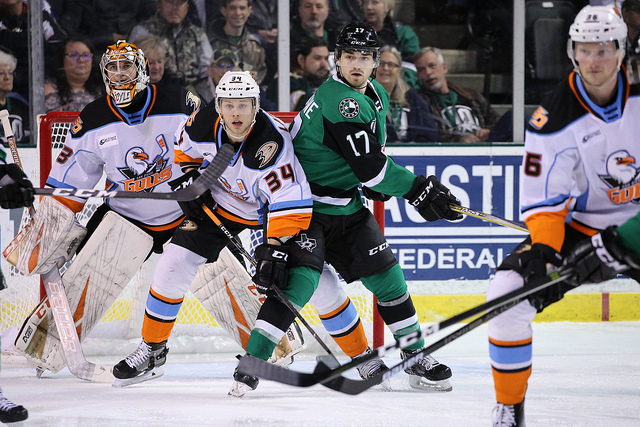 Ben Street scored his first two goals for the San Diego Gulls and assisted on a third and Kevin Boyle stopped 24 of 25 shots in a 4-1 victory over the Texas Stars on Saturday evening in Cedar Park, Texas. Corey Tropp opened the scoring seven minutes, 40 seconds into the game and rookie left wing Jack Kopacka scored 7:07 into the second period as the Gulls (22-13-2-3) rebounded from Friday’s 4-0 loss at San Antonio that ended their 10-game road standings point streak. The 31-year-old Street made his debut with the Gulls Jan. 6 after being assigned to them by their NHL parent team, the Anaheim Ducks. Street had four assists in his eight games with the Gulls before Saturday. Street had the primary assist on Tropp’s goal. With both teams one player short because of penalties, Street took the puck from his own zone, went around several Stars and sent a centering pass from the left wing to Tropp in front of the net, who tapped the puck into the net for his 10th goal of the season. Jaycob Megna was credited with the second assist, his third assist in his last four games. Street began the scoring sequence for the second goal by winning a faceoff and getting the puck back to Jacob Larsson on the right point. Larsson fired a wrist shot toward the net that Street redirected past Philippe Desrosiers 10:03 into the first period. Kopacka gave the Gulls a 3-0 lead 7:07 into the second period when he scored from the top of the right faceoff circle off fellow rookie Sam Steel’s assist. Kopacka was playing in his second game after missing 35 games due to a wrist laceration. The goal was Kopacka’s second in his five-game professional career. Texas rookie center Joel L’Esperance scored on a breakaway 8:32 into the second period for his league high-equaling 23rd goal of the season. Street put in the rebound of a shot by Trevor Murphy with 3:58 left in the third period for his second goal. Patrick Eaves was credited with the second assist, his first point in his five games with the Gulls since being assigned to them by the Ducks on a long-term injury conditioning loan. The Gulls led in shots, 32-25, including a 12-7 advantage in the first period. Both teams were scoreless on two power-play opportunities before a crowd at H-E-B Center at Cedar Park announced at 6,683. Desrosiers (3-5-0-0) made 28 saves for the Stars (22-17-3-2), the Dallas Stars American Hockey League affiliate. The game was the Gulls last before the AHL All-Star Classic on Sunday and Monday in Springfield, Massachusetts. They will resume play Friday by playing host to the Ontario Reign, the Los Angeles Kings AHL affiliate, at Pechanga Arena San Diego.